Do you enjoy spending your summer evenings next to an outdoor fire with your favorite snack? If so, this is the popper for you! The Open-Fire Pop ™ Popcorn Popper's unique design allows moisture to escape during popping so your popcorn is always tender and crisp. 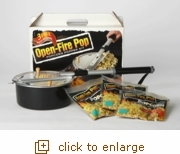 Make hot, crunchy mouth-watering popcorn in minutes with the old-time "shake and pop" experience over your campfire, fireplace or backyard grill!